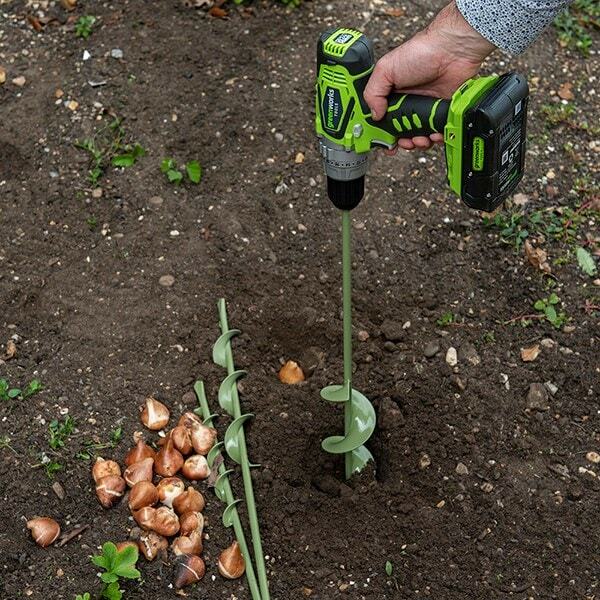 These soil-digging augers are a brilliant way to plant bulbs, particularly in heavier soils. 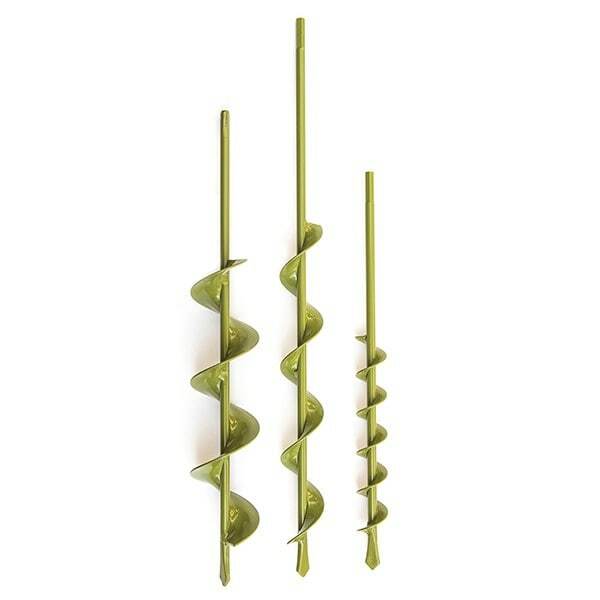 They're especially great if you have loads to do, as you can drill planting holes in record time. The best way to use them is to dig the holes in stages, lifting it out once or twice so the loosened soil is deposited next to the hole. Once the hole is deep enough, pop a bulb in the bottom (pointy side up) and refill with the loose soil. The ingenious tool can also be used for aerating the compost heap. The augers are designed to use with a cordless drill with a voltage between 18 and 24 volts (not included), and have a 'hex' end to stop them slipping around in the drill chuck. To be on the safe side and avoid twisting your wrist (if you hit a rock or tree root), the torque settings on the chuck of the drill should be set to medium. I have used this item to cut a hole for 75mm fence posts, in the middle of a forest, just wish I'd thought of this years ago. Struggles a little with clay soil, but all depends on the cordless drill. Very useful tool!! Fantastic, bought these over three years ago and have planted a few thousand bulbs using them, I find them especially useful for planting in lawns. They are still as good as the day I bought them, used in various soil types including chalky soil with flit stones in! Works fine with a decent cordless drill. The augers are very strong and well made. Ideal for making holes to plant bulbs. However they are very long which makes them heavy and somewhat difficult to use. I wish I had bought it years ago! It's the best possibile way to plant bulbs. Fast, easy, clean. Ilive in Italy, in area of very hard clay, where planting bulbs used to be like an exhausting struggle. With the planting auger this year it was a real pleasure. I need to add that when I bought it my husband was skeptical, but he had to admit that it is a wonderful tool. Tremendous help in our garden which has very stony poor soil. I struggled to dig planting holes for bulbs but with these augers I can plant a pack at a time with no trouble at all. Very useful in woodland areas where you don't want to disturb roots. Such a simple idea and easy to use. I wish I had one many years ago. beacause it is simple and easy to use there are no drawbacks whatsoever. The most useful tool I have ever used. I bought this product for the purpose of planting flowering bulbs>> daffodils mainly and as I have some hand problems I was looking for something to use instead of a garden trowel. The auger fit the bill exactly. Not only does it drill the holes for planting bulbs I use it for planting pot plants. It is also great for removing deep rooted weeds. It says 'designed to use with a cordless drill with a voltage between 12 and 18 volts'. Is there any reason why I could not use a 240v corded drill? Hi. Although these will work fine in a more powerful drill, the main reason we recommend a cordless drill is the safety aspect involved. Using any kind of electrical equipment in the garden carries a risk, and this is heightened by the increase of power and use of mains electricity. Hope this helps! Good afternoon, Thank you for your query, the dimensions of all augers are located on the bottom of the item page, these products are manufactured in China.